.There's an offside or infringement but the referee hasn't noticed. It's down to you to make that critical decision and raise your flag. Seldom praised but essential to any football match, linesman play a vital role throughout the ninety minutes and the Ali Handle Linesman Flags make your job just that little bit easier. 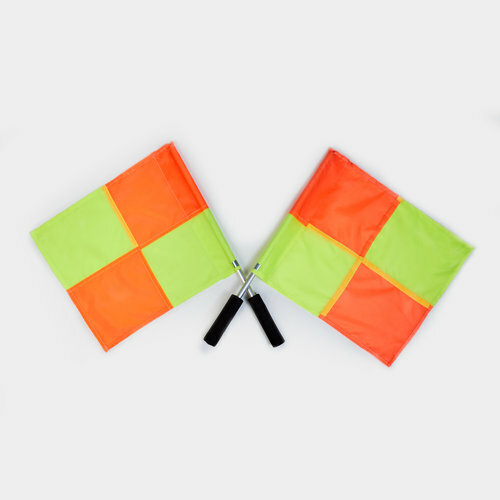 Using brightly coloured fluorescent yellow and orange chequered flags, no matter what the weather conditions you'll be clearly visible along the sideline and all those important decisions will be flagged up. Featuring soft, padded handles, you're ready to make the call and confidently raise a flag when needed.